With this system you can brush with automatic suction brush your dog or cat in a fast, comfortable and hygienic, preventing the hairs are loose around the house. Simply connect the vacuum system and you can comb and brush pick up the hair all at once. In just 5 minutes, your dog will look spectacular and your house will be clean and without a single hair, preventing or avoiding allergies. Can be used in dogs and cats with short hair or long, dry or wet. It is a patented product made in France by the company Jappyland. The special brush removes a lot of dead hair and undercoat without breaking or jerk. 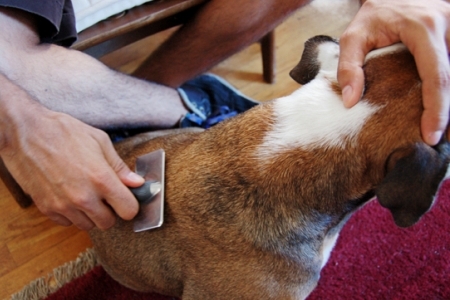 Your pet will enjoy a leisurely brushing, you get rid of those pesky stray hairs and itching. Removes loose hair without damaging the animal’s skin also stimulates the production of natural oils that provide a healthy skin and shiny. Health cares also of the whole family because it reduces the number of hairs in the environment, achieving cleaner and healthy reducing allergic reactions in some people. This system of self-suction brush is made of durable and quality materials. The tank, hose and brush handle are made of polyurethane plastic. The wiper blade is made of stainless steel. The brush has a self-cleaning, pick up your pet hairs and inserted into the vacuum nozzle to be sent to the tank. The filter collects all particles including optimizing the extraction and protecting the operation of the vacuum. The filter is durable, washable and is equipped with a safety valve. The extra long hose allows the vacuum to keep some distance to avoid frightening or startling by the noise. The base has 4 media that can store up to 4 brushes deferens. The cap has two clicks of closure and a carrying handle for ease of movement. Connect the vacuum to the reservoir tank. Plug the vacuum and brush the dog normally. Pressing the flushing, the hairs collected go to the tank preventing it from dispersing throughout the room. After the brushing, emptying the tank in a trash bag. Suction tank of 12 liter capacity.